1. In a medium, heavy pot over medium heat, combine the sugar, butter and water. Stirring constantly, cook until it is a thick syrup, about 5 minutes. 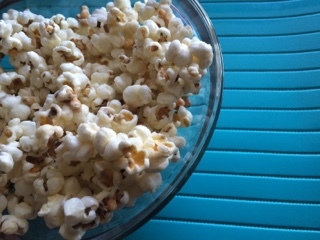 Remove from the heat and pour all over the popcorn. Stir to coat evenly. 2. Turn onto a sheet of parchment paper to cool.